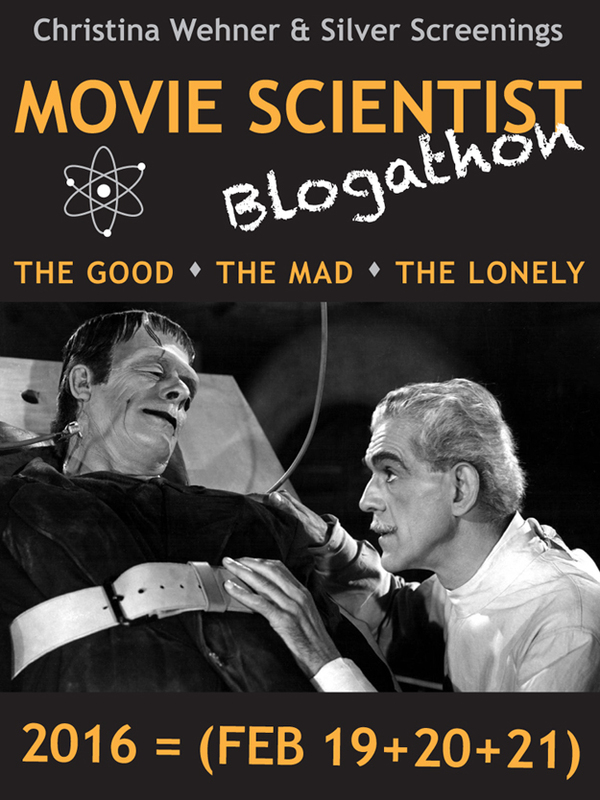 Excited to be co-hosting this blogathon with Christina Wehner. We’re looking forward to your take on Movie Scientists! Why? – Silver Screenings and I were discussing how scientists who work alone are prone to silly errors. In a collaborative environment, surely Frankenstein would not have inserted that abnormal brain into his monster. And surely Dr. Jekyll would have had no need to test his formula on himself (talk about uncontrolled environment!). The greatest mistake scientists make is to work alone. And in many ways, the scientist is alone…a unique figure burdened with responsibility. Scientists, perhaps even more than superheroes, get to either save the day or wreck it. Oh, this looks delicious! I’d love to contribute something, but can’t promise. I have to deliver the new magnum opus at the end of February so the blogathon’s happening exactly when I’m likely to be in full-blown, stark staring rabbit-in-the-headlights panic mode. Ack – that’s too bad for us…but fingers crossed that you’ll have some spare time in Feb – ha ha. Would love to have you join if you can, but if not I understand. Excited to join in with focus on the mad jealous acid-inventing husband in Obsession (aka The Hidden Room)! Thanks! I’m so tickled! I look forward to it. So glad you’re joining us, Virginie. This is going to be lots of fun! I just did a tribute to George Stevens, going all the way back to his Laurel and Hardy days (you know you’re knee-deep in research when one of your Google searches is “George Stevens and a goat”), and for space reasons, sort of skipped over Vivacious Lady. James Stewart is a botany professor in it. Is that close enough to a scientist? I understand if it’s not! But I’d love to do this movie! In any event, I look forward to reading the others! Thank you so much, Ruth!! My long love letter to George continues… plus it’s got a fight scene with Ginger Rogers and a dance number with Beulah Bondi! !